Dating largely from the early 16th century with later additions, Rushton Hall is a truly magnificent piece of architecture that wholly warrants its Grade I listed status. It is far beyond the scope of Nights in the Past to provide a detailed account of its rich history, but it is known that Charles Dickens stayed at the house on several occasions. A friend of the then owner, Clara Thornhill, some believe that he conceived of the idea of Haversham Hall in Great Expectations during one of his visits. 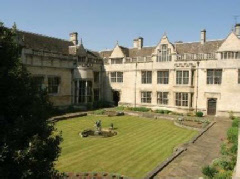 The hall also has a connection to Francis Tresham, one of the Gunpowder Plotters (he being the eldest son of Sir Thomas Tresham, for whom Rushton Hall was his family’s ancestral home). The hotel features a total of 46 guest bedrooms including State Rooms, Four Poster, and Deluxe Four Poster Suites. It also features its own Stableyard Spa which includes a swimming pool, steam room and gym.